Artitec offers a large variety of structures, ships, vehicles, figures and other models made both out of plastic and resin. They also offer a good selection of WWII military vehicles and figures. Most of the Artitec models are kits however they are now producing many items that are painted and assembled. If they don’t offer the kit assembled and painted our REI paint studio does exquisite work, our experts can assemble, paint and weather just about anything. 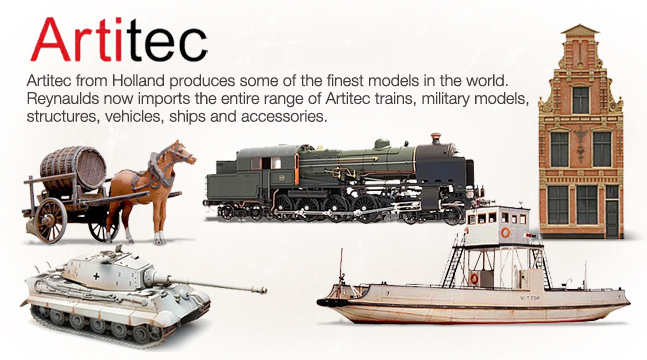 Artitec models distinguish themselves from other models by their superior realism, their richness in details and by the fact that they are very accurate copies of historical or still existing vehicles and ships. They can reach this grade of realism only by using resin as the basic modeling materials. When you compare resin models with injection-molded products, you will see that details like bricks, roof tiles and wood patterns look much more realistic in resin. Working with resin and painting the model will be new to many of you, but it isn't any harder than other techniques used by you as a modeler. In Artitec's building instructions you will find everything you need to know, explained in simple steps. Reynaulds is proud to represent Artitec and their exquisite product assortment.